This years Vision Expo took place at the Jacob Javit’s Convention Center in New York from March 16th to yhr 18th. This show is a massive with over 715 companies filled the Exhibit Hall, featuring the latest in eyewear and the latest innovations in science and technology. It was estimated that over 30,000 eyecare professionals attend the Vision Expo each year. All of the major eyewear players were at the show including Safilo, Zyloware, Essilor, Luxottica, frame makers that produce the major portion of the frames sold around the world. These companies own and manufacture most of the brand name frames you see in your optical stores and on the internet. Of course we found many boutique companies that offered some very exciting and moderate priced frames as you will see in our photos and video. One such company whose owner and designer Morganne Leigh, a first time exhibitor at the show can be seen explaining her company Tyche + Iset in our video. Beautiful frames at reasonable prices too. There were many thousands of beautiful frames showcased at this show, some costing upwards to a thousand dollars or more. But for those of us that are not in the high net worth individual category, they also offered frames as low as $20. The Vision Expo is not a consumer show it is a trade show which means those that attended the show had to qualify. There were thousands of Vision care professionals at the show and yes your eye doctor was probably there too. If you are in the Vision industry you needed to attend this show to see some of the latest and greatest vision gear and equipment to keep up with the latest developments in the industry. Aside from the frame manufacturers, there were many companies that produce the lenses for those beautiful frames. Luxexcel was one of the revolutionary companies that displayed their latest technology. It was a 3D printer that could produce the most difficult prescription lenses through this amazing new technology. With 3D printed lenses an ophthalmic lab can print lenses in the exact shape as required by the patient. Luxexcel is the only company able to print ophthalmic lenses, today. 3D printing is a revolutionary technology to build a lens from little droplets without any need of semi-finished blanks, the lenses are built in the shape and accuracy required without the need of polishing. They couldn’t bring one of the units to the show, it weighed 10,000 pounds, so they showed as a time-lapse video that shows how the lenses are created. There are only two locations in the United States that now have this revolutionary equipment, but I am sure there will be many more in the future. Of course there were all the vision equipment manufacturers that offered the latest equipment to aid your eye care doctor in performing eye exams. Companies like Zeiss, Kodak, Tamron, Topcon, Transitions and many others. So much technology with leaders in the field. I for one visit the many companies that produce eye drops for dry eyes, a problem I have now that I am older. Of course if you don’t want to take eye drops, there are products like Maxi Tears and Hydro Eye that offer softgelpills that you can take that contain Omega 3 Fatty Acid and vitamins that helps normal production of tears and retinal health. I started taking Maxi Tears last year and I can vouch for it personally. Of course at times I still might need a shot of the many lubricant eye drops like Refresh and Retaine, especially when watching hours of television or working at the computer. Many of the companies on the lower level displayed some new and cutting edge equipment including are companies like Optos that can take an image of your retina in less than a second. No need to dilate your eyes anymore and have the doctor peek into your pupil to see the retina. 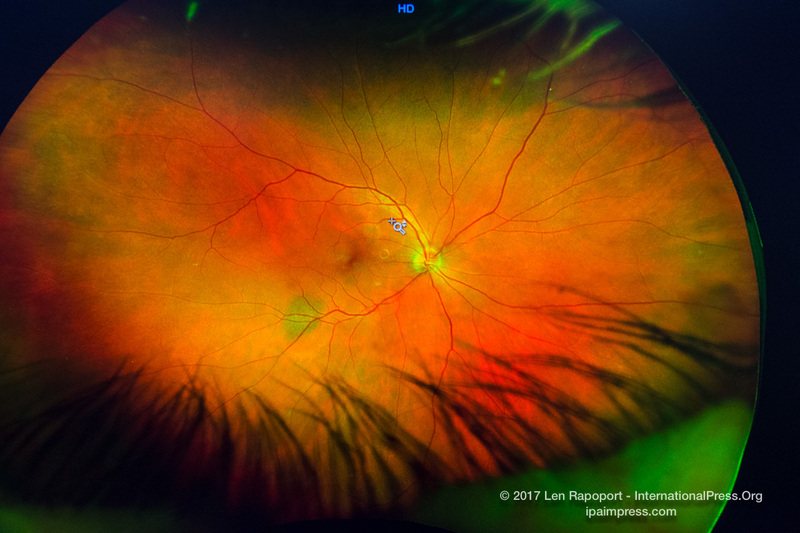 The optomap® Retinal Exam produces an image that is as unique as your fingerprint and provides the doctor with a wide view to look at the health of your retina. The retina is the part of your eye that captures the image of what you are looking at, similar to film in a camera. Vision Expo is one we love to cover each year. Of course we also love the NY Auto Show, the Photoplus Show and others, but this show caters to doctors and eye care professionals and when I say “caters” I mean just that. Champagne flows, cakes and cookies, snacks of all sorts and of course coffee, espresso, capuccino, soft drinks and more are available through the day. Click Image of the Vision Expo or our link to see our photos Flickr Photo gallery. For commercial use please contact us for details.